Red 10mm spacer for F5 template. Make two passes to complete the joint. The red 10mm spacer is used exclusively with the F5 template. 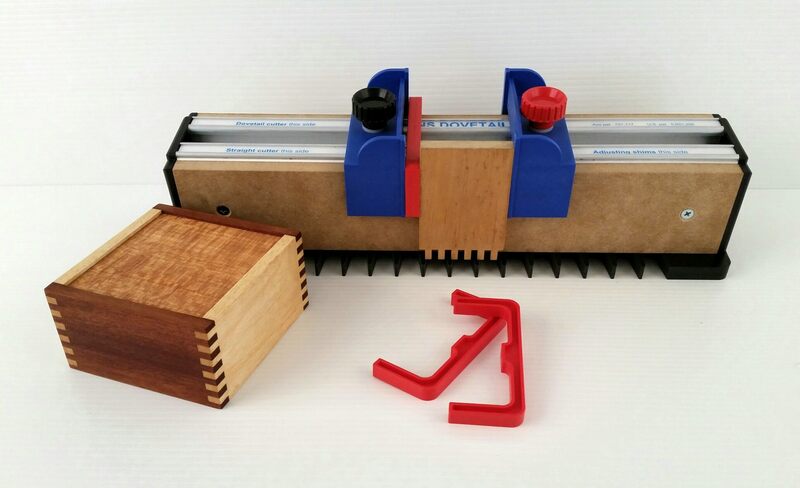 Use it to make two cutting passes per edge to cut a full set of 5mm fingers. Place the 10mm spacer against the left hand jig stop. Now place your timber on the jig beside the 10mm spacer; draw up the right hand jig stop. Cut the first set of fingers. Take care to clean out all the material by working the bearing against the inside wall of each finger. Finally, swap the places of the spacer and the timber to cut the second set of fingers. The image in the gallery shows timber after the first cutting pass. Finally, your instruction manual has full details on cutting accurate finger joints! We recommend that you purchase the Finger joint demonstration DVD. It’s a visual representation of the finger joint chapter in the instruction manual.